In this timely and important new book, Gary Anderson provides a devastating critique of why a managerial role for educational leaders is counterproductive, especially for improving opportunities for low-income students and students of color, and instead proposes ways of re-theorizing educational leadership to emphasize its advocacy role. 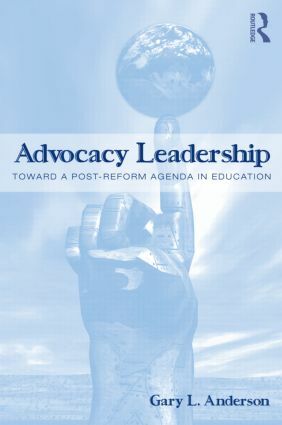 Advocacy Leadership lays out a post-reform agenda that moves beyond the neo-liberal, competition framework to define a new accountability, a new pedagogy, and a new leadership role definition. Drawing on personal narrative, discourse analysis, and interdisciplinary scholarship, Anderson delivers a compelling argument for the need to move away from current inauthentic and inequitable approaches to school reform in order to jump-start a conversation about an alternative vision of education today.